Honoring ceremony for Nidal Al Achkar opens the Department of Communications Arts’ Festival Next with flourish. Al Achkar with Lebanese actress Bernadette Hodeib (C) and performers. 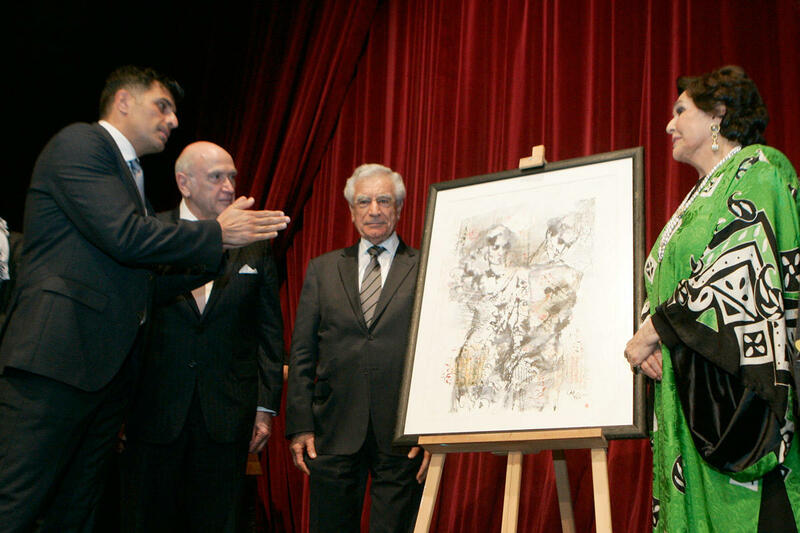 Dr. Melki and Dr. Jabbra presenting Al Achkar with the painting by Leila Kubba. Irwin Hall Auditorium was packed ahead of a ceremony for the grande dame of Lebanese theater, Nidal Al Achkar. Wearing her signature abaya, the actress/director breezed in, greeted familiar faces, shook hands and embraced friends as she made her way to the front row. The evening was part of the Communication Arts Department’s Festival Next – which runs from March 18 to 22 – and included music, a short screening, and a play in Al Achkar’s honor. Esteemed guests packed the auditorium, including Minister of Culture Mohammed Daoud Daoud, MP Rola Tabsh, foreign ambassadors and dignitaries. Also in attendance were Board of Trustees Chairman Peter Tanous, LAU President Joseph G. Jabbra, and a host of deans and faculty members. Al Achkar, who graduated from the Royal Academy of Dramatic Arts in London, steered the theater movement in both Lebanon and the wider Arab world. She founded the Beirut Theater Workshop in 1966, a period some call Lebanon’s Golden Age. By the mid-80s she had established the Arab Actors Theater Company in Amman, Jordan, following the outbreak of the civil war in Lebanon. The company included members from 13 Arab countries whose tour of the Arab world culminated in a performance at the Royal Albert Hall in London. She also founded the Al Madina Theater in 1994, which was redeveloped into the Al Madina Theater Association for Art and Culture in 2005. The audience was then treated to a series of songs by Rafka Rizk and George Helou in the Caledonian, Assyrian and Syriac languages, followed by a 20-minute film written and directed by LAU Assistant Professor of Film Sabine El Chamaa in collaboration with Associate Professor of Theater Lina Abyad and Al Achkar herself. The film depicts Al Achkar during a workshop where she coached students on how to use their bodies and voices on stage, interspersed with memories of her as a young woman. A short play followed, written and directed by Festival Next coordinator and LAU alumnus Awad Awad (BA ’16) and Assistant Professor of Music Amr Selim. 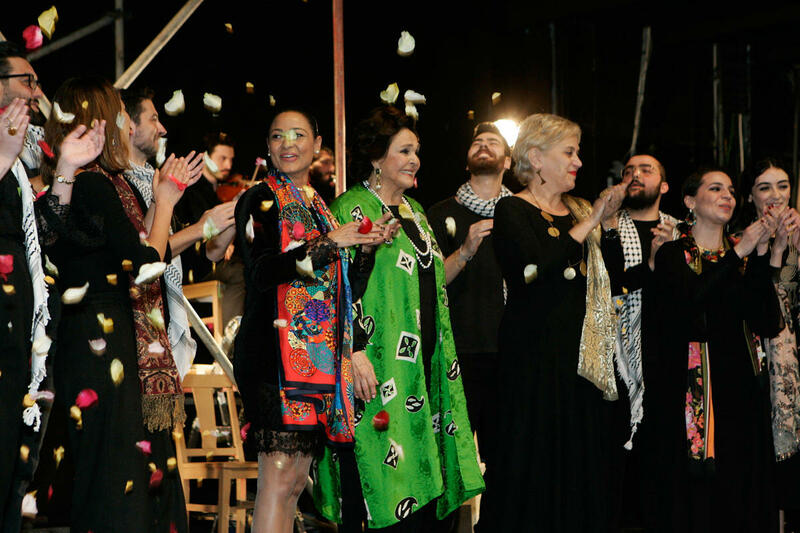 The performers, who included students from LAU and other universities, in addition to professionals such as Lebanese actress Bernadette Hodeib, presented scenes depicting Al Achkar’s personal anecdotes. For his research, Awad scoured archives, theater recordings, speeches, and interviews from the 1970s. “I have worked closely with Nidal for eight years, and I interviewed her family and people who know her,” he said. At the end of the performance, the actors ushered Al Achkar onto the stage and showered her with rose petals. “I have never once thought about living in another land,” Al Askhar told the crowd. “I hope never to leave this world before I drink from the Litani River, travel by train to Arab capitals, see free admission at hospitals and schools, and a library for all, and for streets to be named after Arab poets and literary figures,” she said. She was then presented with an oil painting by prominent artist Leila Kubba called Relations. Giving a brief history of Festival Next, Dr. Melki said the five-day event is a testament to the department’s mission to “reinvent communication” as it moves forward in promoting interdisciplinary education. The program includes film screenings; public speeches and film competitions; food and art exhibitions; research presentations; debates about religion, marriage, activism and conflict; communication campaigns to raise awareness about mental health; numerous workshops; and theater, dance and music performances.